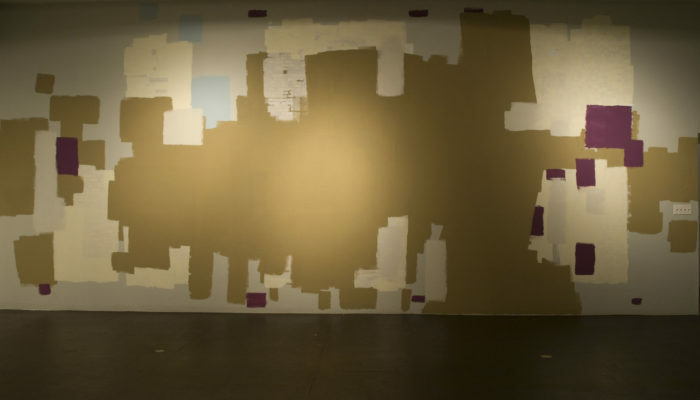 ?Kim Schoenstadt’s Painted Over/Under Parts 1-4 is a year-long project based on the mismatched color patterning created by “graffiti maintenance” on freeway retaining walls and other open walls in the city. Parts 1-3 will incorporate guest curators Les Figues Press, Jens Hoffman and Erin Cullerton who will invite writers, artists and architects to create drawings in shifts on the walls in LACE’s rear gallery. 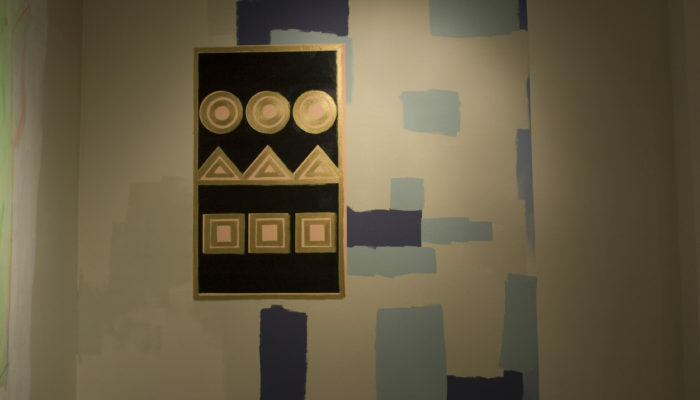 With each part of the project, works will be written and/or drawn onto the walls, then painted over with Schoenstadt’s color palette, creating a layered, abstracted painting defined by the shapes of past projects, offering a new starting point for the next group, and so on. 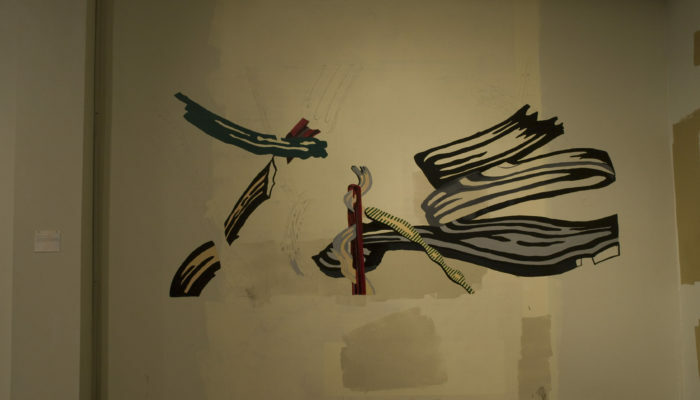 Prior to each “painting out,” Schoenstadt will apply tape on the large wall drawing to preserve portions of the work below. Part 4 will reveal the complete drawing, which will be constructed out of fragments of the project’s history. www.kimschoenstadt.com. Click here to visit the Painted Over/Under blog. Embracing the theme Making Place, Painted Over/Under: Part 3 showcases two-dimensional, abstracted vignettes of the Los Angeles cityscape envisioned by architects and designers. As both an exercise in artful placemaking and a response to the powerful imagery of forgotten places, Making Place explores the myriad ways Los Angeles has layered itself into a complex network of activity—at once dense and urbanistically challenged—that defies its semi-arid condition. Taking inspiration from various forces such as access to water and transportation and the impact of sprawl and developer-led density, each selected teach of architects investigate the mini cities that constitute Los Angeles. By exploring successful and not-so-successful examples, both real and imagined, Part 3 attempts to reveal the complex essence of Los Angeles. Making Placeincludes the work of Los Angeles-based architecture firms Predock_Frane Architects, Chee Salette Architecture Office, and Florenica Pita mod. Erin Cullerton is the founder of Design Agency Co., a boutique agency specializing in communications and strategy services for the creative industries. The former Assistant Director of the American Institute of Architects in San Francisco, she has produced nearly 40 exhibitions on a range of topics from public art in architecture to investigations on the urban environment. In 2003, she founded the Architecture and the City festival, an award-winning, city-wide event held each September in San Francisco that reaches more than 20,000 participants and draws support from hundreds of cultural institutions and community partners. In 2005, Erin was instrumental in founding the Center for Architecture and Design, a new nonprofit organization seeking to educate the public about the importance of architecture and design. A consummate advocate for good design, Erin sits on the editorial advisory board of The Architect’s Newspaper, California edition, the Development Committee of the A+D Museum, and the Founding Committee of the Southern California Architecture and Design Consortium. Her writing on design has appeared in ARTnews, Metropolis, ReadyMade, Surface, Time Out London and she is the editor of the publications Contemporary Prefab Houses and Young Architects Americas. Led by Tina Chee and Marc Salette, Chee Salette Architecture Office (csao) is a multi-faceted practice that was founded after each partner honed their craft working on extraordinary projects with some of the most accomplished architecture firms in the world, including Gehry Partners, Renzo Piano Building Workshop, and Foster and Partners. Committed to sustainable design, csao believes architecture and urban design can play major roles in addressing fundamental issues such as global warming, overpopulation and finite natural resources. csao strives to design buildings and places that bring people together and enrich their lives in a meaningful way, while engaging their environment and challenging conventional culture. Current projects include the development of a Master Plan for Piggyback Yard, an initiative of the Friends of the LA River (FoLAR), as part of the PBy Collaborative, and the HSBC Building and Queen City Landing Master Plan in Buffalo, New York. Founded by Hadrian Predock and John Frane, Predock_Frane Architectsis a collaborative research and development design studio whose work ranges from small-scale installations to large public venues. Named one of ten emerging architectural firms by Architectural Record and one of six emerging international firms by the Architectural League in New York, they were selected to represent the United States in the US Pavilion for the Venice Biennale, participated in the Cooper Hewitt Design Triennial – Design Life Now, and have exhibited at the LA Forum Gallery in Los Angeles, and Pomona College Museum of Art. They have won numerous awards, including multiple national and local American Institute of Architects (AIA) Honor Awards, their work has been published internationally, and they have lectured widely. Florencia Pita mod is a collaborative practice dedicated to the use of digital technology. An architect, teacher and researcher, Florencia Pita currently teaches at Sci-Arc in Los Angeles and is also on the visiting faculty of Lund University, Sweden. She has practiced architecture in the offices of Greg Lynn FORM, where she participated in the World Trade Center Design Competition as part of United Architects, Eisenman Architects and Asymptote. Her work has been showcased in solo exhibitions at SCI-arc Gallery and LA><ART, and in group exhibitions at The Art Institute of Chicago, the 2007-08 Shenzhen-Hong Kong Biennial of Urbanism and Architecture in China, and Artist Space in New York. Her work is part of the permanent collection of the MAK Museum in Vienna, and is currently on view at The Art Institute of Chicago. Curator Jens Hoffmann invited eight international emerging visual artists to comprise his curatorial segment for Painted Over/Under. Each artist has designed a site-specific piece inspired by the street art and its prevalence practice throughout the world. Wall works will go up throughout the exhibition via long-distance communication between each international artist and select Los Angeles art student and young artist partners. Participating artists: Zarouhie Abdalian, Johanna Calle, Arabella Campbell, Adriana Lara, Jazmín López, Anna Parkina, Gitte Schäfer, and Maaike Schoorel. Les Figues Press starts Painted Over/Under: Part 1 with Not Content, a series of text projects that investigate the ways in which language functions within public and private spheres and within the tenuous and transitory space between these real and imagined realms. How does public discourse construct narrative selves, and how are internal voices manifest as public discourse? What is unsaid beneath the saying and said within a silence? What is covered or uncovered via the incessant text around us, and when is a wall a law, a border, a protective shield, a frame, a taboo? Not Content will take place as a series of writers-in-residence. Most residencies will last for three weeks, during which time the writer will engage in a project that considers the physical and temporal space of the gallery/residency. During the summer section, there may be up to three writers in residence at the same time; at other times of the year, there may be only one writer in residence. 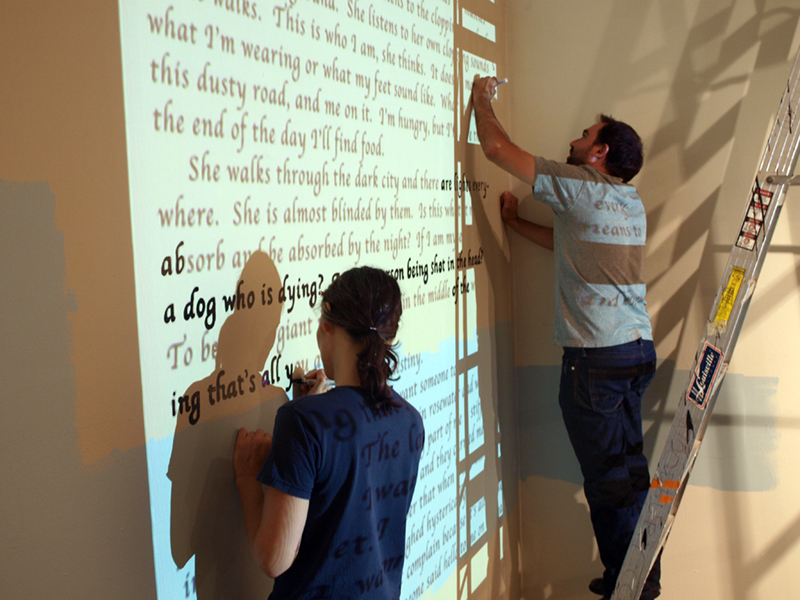 At or near the end of each residency, LACE staff will paint over the text using a matrix provided by Schoenstadt. In this way, text and image will fuse and accumulate over the course of the year. Presenting Writers: Vanessa Place, Divya Victor, Douglas Kearney, Maxi Kim, Gaby Torres and Jenny Donovan, Amina Cain and Jennifer Karmin, Mathew Timmons, Yedda Morrison, Johanna Drucker, Marco Huerta, Sawako Nakayasu, and Christine Wertheim. Click here to visit Les Figues Press’ blog on Not Content. Maxi Kim was born in a military camp on Mt Paekdu, the tallest volcanic mountain on the East Asian peninsula. He studied Japanese and American literature at University of California, then studied French theory at California Institute of the Arts, where he wrote his first novel One Break, A Thousand Blows. 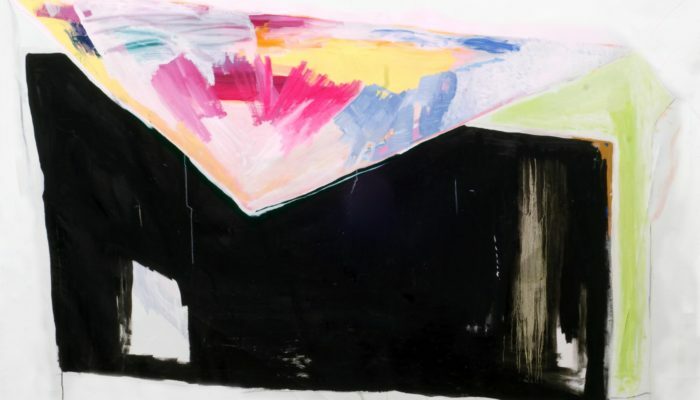 His writing has been compared to the visual art of Richard Prince, Wallace Berman, and the films of Sofia Coppola. In 2008 he moved to London, and taught writing. He currently lives in San Francisco. According to an ancestral inscription his birth was heralded by the spectral presence of the haiku poet Issa over the mountain’s caldera. Jenny Donovan is an artist, writer and translator, whose work has appeared in numerous journals, including Revista Espiral, Papeles de la Mancuspia, Encyclopedia Volume 2 F-K, Abrazo, and Bulbo Press. She has presented work in various independent spaces and museums in the US and Mexico, including: Museo Carrillo Gil (México City, D.F. ), The San Diego Museum of Contemporary Art, Intersection for the Arts (San Francisco), El Museo Nacional de La Ciudad de México, (Mexico City, D.F.) and El Centro Cultural de Tijuana (CECUT). With Gaby Torres, Donovan co-directs La Derramadora Press, a binational and bilingual independent press that produces small editions of hand crafted books from recycled materials. Gabriela Torres Olivares is the author of three collections of short stories, including Regiomonteses (enfermario) (ediciones La Derramadora press, 2008 and Tierra Adentro, 2010), Están Muertos, (Harakiri Plaquettes, 2004), and Incompletario (Ediciones Intempestivas, 2007). Her work has appeared in numerous anthologies, including: Caja de Viento (Ediciones El Árbol) and La Difícil Brevedad (2006), as well as in numerous periodicals. Torres currently lives in Tijuana, B.C., where she is the co-director and chief editor of La Derramadora Press. Mathew Timmons is a writer, curator and critic in Los Angeles. He is the General Director of General Projects at various locations including Outpost for Contemporary Art and The Ups & Downs, an installation series, at workspace. He also is the editor of Insert Press and co-curator of Late Night Snack (w/ Harold Abramowitz). His works include CREDIT (Blanc Press) and LIP SERVICE, a chapbook published by Slack Buddha Press. Forthcoming works include: The New Poetics (Les Figues Press), his micro-book collaboration with Marcus Civin, a particular vocabulary (P S Books), and a chapbook, Lip Music (By the Skin of Me Teeth). His work may be found in various journals, including: P-Queue, Holy Beep!, Flim Forum, The Physical Poets, N?D, PRECIPICe, Or, Moonlit, aslongasittakes, eohippus labs, Area Sneaks, Artweek and The Encyclopedia Project. Johanna Drucker is an artist and writer who is known for her experimental typographic books and her critical writings on visual poetry, typographic history, and digital aesthetics. She teaches in the Information Studies Department at UCLA. Marco Antonio Huerta is the author of three poetry collections: La semana milagrosa (Conarte, 2006), Golden Boy (Editorial Letras de Pasto Verde, 2009), and Hay un jardín (Tierra Adentro, 2009). His work has been published in several periodicals and anthologies both in Mexico and Spain. Born in Tampico, Tamaulipas, Mexico in 1978, where he currently teaches English, Literature, and Creative Writing. Bachelor of Communication, MA in Teaching. Member of Colectivo Perros de Agua, a group of writers and artists who promote reading among young people. Christine Wertheim is MFA Writing Program Chair at Cal Arts. She is the author of +|’me’S-pace (Les Figues Press), a book of poetics, and a chapbook from Triage. She co-edited the anthologies Seancé, Noulipo, and Feminaissance. Recent critical work has appeared in X-tra, Cabinet , The Quick and the Dead, and Walker Art Centre. Recent poetry appears in Drunken Boat, Tarpaulin Sky and Veer. Her new book is a poetic suite on mothers.